While her mom is out of town 10 year old Olivia and her almost 18 year old brother are left home alone. While Olivia is taking the dog out for a walk one night she witnesses some one being kidnapped. Her brother thinks she's nuts. However a nice cop (played by Susan Sarandon) does, but with no evidence there is nothing she can do. Olivia then takes the case in her own hands and tries to solve the case. The problem with the film is that despite coming from writer/director Kevin Kaufman and Executive Producer, Rick Tirelli who worked on "NYPD Blue", “Watching the Detectives,” “I Married a Mobster” and “The Perfect Murder" the film is very much a kids film. Seriously outside of the death of Olivia's dad in the opening minutes there is nothing tough or offensive in the whole film. Its so sweet and saccharine that I'm guessing tooth decay will result if the film is seen too many times. Its not a bad film, rather it's simply too much of a kids film. The result is that unless you are in a narrow spectrum this is a film you're going to like but not love and short of having some one of the right age for the film you're going to wonder why you are watching it. 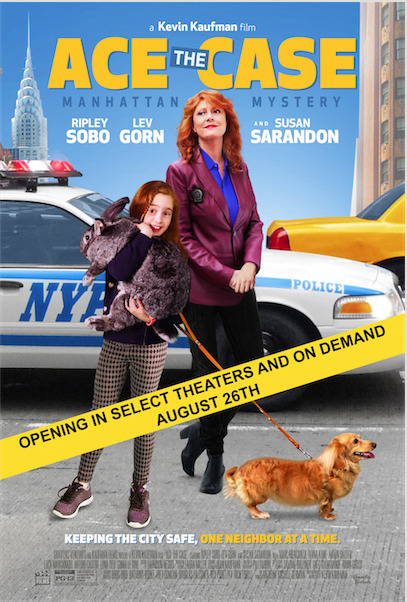 I do like chunks of the film, I think Sarandon is a hoot and a half, and the mystery is pretty cool. The trouble is that they aimed to please kids and unless you're a kid around ten you're not going to care for it much. Worth a look for families who've seen the major kids films too many times or fans of Susan Sarandon- all others can steer clear.